Man catches cheating wife using drone, ends 18 year-old marriage – Kenyatta University TV (KUTV). All Rights Reserved. A man has the feeling that the forty days of the thief phrase has finally rested on shoulders of his dear wife. The is after he caught his wife cheating on him using a camera on a drone to catch her out. The man exposed the wife by uploading the footage to YouTube with a commentary that shows his anger and heartbreak at the collapse of his 18-year marriage. ‘Used my drone to catch my wife meeting a guy at the local CVS'” he captioned the video. 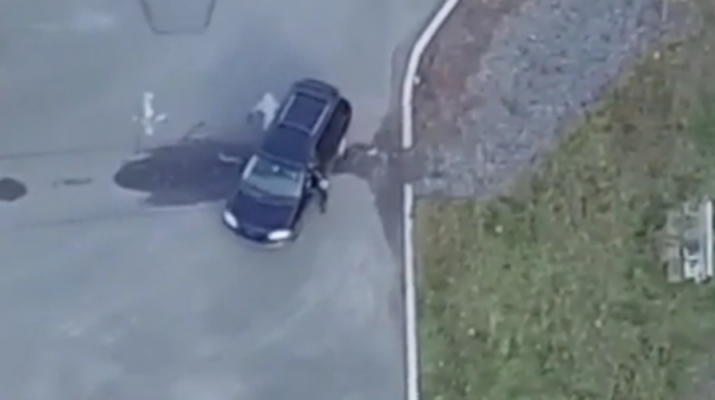 From the footage, the woman is seen stranded at the roundabout a she awaits for the appearance of the man. After checking that she looked pretty by straightening her air, she proceeds to cross the road after receiveing a call. A car pulls by, gives the man a kiss while in the car, walks around and gets inside the car before the man speeds off with her. After watching the drone aid him catch the cheating wife, the man immediately called off the relationship and decided to embarass the woman be telling the world, through you tube.